I am a fellow curly/wavy here. I have always hated my hair. I always prayed to god that one day when I wake up I wud have silky straight hair. But now after years of struggling and fighting with my hair I am giving up. I will now let my hair be what it wants to be and how it wants to be. I have been reading this forum for about 2 mnths. I started CG for about a month now. 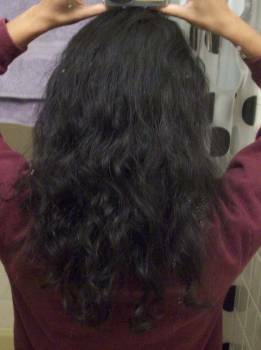 I am satisfied with the results compared to how my hair was before but I still think it can be a LOT better than this. 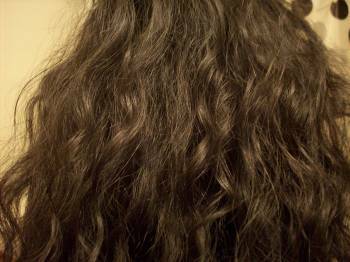 My hair is very dry and hair falls a lot ( i cant figure out really whether it falls or breaks ) I have considerable amount of frizz which I think is all those broken hair. I never blow dry , let it air dry. I think I am a type 2b/c. I know classification of hair doesnt matter but I do wanna know. Please let me know if u guys think my hair is 2b or 2c. 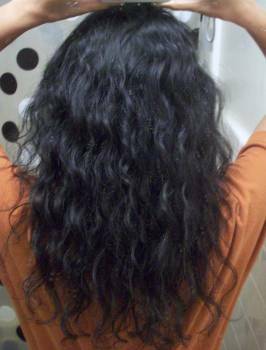 I use tressme naturals to co wash and aussie deep condition as a regular conditioner. Sometimes I even use the same tresseme as the regular conditioner. When its towel dry I put the tressme curl hydration styling lotion creme and then put on the aussie catch-the-wave mousse and scrunch. thats it. 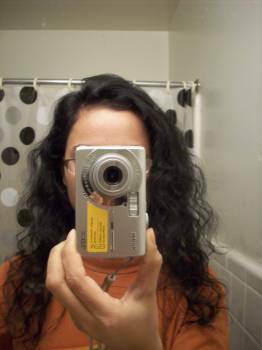 Any suggestion on how to make my hair look not so dry and look shiny? I want chunky curls not think curls like mine. Do you think I am doing everything all rite? Please help. I really want to love my hair. 1st pic is before CG and the rest taken today. I washed my hair 2 days ago. Last pic is a randon grp of hair thats not curly. lol. Water (Aqua), Cetearyl Alcohol, Propylene Glycol, Cyclopentasiloxane, Peg/Ppg-18/18 Dimethicone, Behentrimonium Chloride, Dmdm Hydantoin, Steareth-21, Fragrance (Parfum), Disodium Edta, Hexyl Cinnamal, Benzyl Benzoate, Limonene, Butylphenyl Methylpropional, Linalool, Citronellol, Geraniol, Hydroxyisohexyl 3-Cyclohexene Carboxaldehyde, Alpha-isomethyl Ionone, Polysorbate 20, Cinnamidopropyltrimonium Chloride, Hydrolyzed Wheat Protein, Hydrolyzed Wheat Starch, Tocopheryl Acetate, Panthenol, Ascorbic Acid, Niacinamide, Biotin. The terms in bold are silicones (they normally end in -cone, -conol, or -xane), the terms that I underlined are water-soluble cones (you don't need to worry about these -- I italicized them just so you'd know what they looked like), and the terms in italics are polyquats (these have the potential to build up on hair -- some hair eats them up, other hair rejects polyquats, hence the buildup.) I'd start by doing a sulfate shampoo to rid your hair of all those nasty 'cones and getting yourself some new stylers! The drugstore gels that some people rave about on here are the LA Looks and Herbal Essences gels. You can explore the stores for others -- you just need to be on the lookout for polyquats and 'cones. Once you do your sulfate poo and eliminate the styling products with those ingredients in them, you'll be on the road to happy, healthy hair. Also, be sure to check out the 2's forum. We have a friendly "wavy" community down there. Good luck! And I hope this helps you. Try to hang in there. Loving what you've got is a wonderful thing. Hi guys thank you for your comments. I'd def try to avoid the cyclo....blah lol and i am not going to give up. Go Curly!! To add on to the earlier comments, you might want to experiment with different products and see what your hair likes. Different products work for different people. Alot of the ladies here use the Curl Junkie products and swear by it. You can get some samples from Kathymack to see if you like them. Remember to wash your hair one last time with a clarifying shampoo to get rid of all the cones! Your hair looks great so hang in there!! It looks 2-bish. And it is beautiful. Keep it up, your hair will thank you and you will be very pleased. 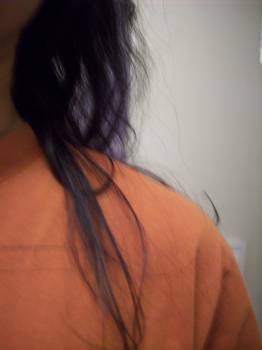 It looks like you could benefit from trimming the ends too. Once you do that it will look thicker, more even and grow stronger.